Kann mir das jemand übersetzen. Mein Englisch ist leider nicht so perfekt. Und ich glaube, es geht etlichen Menschen so. Lasst uns für ein Ende der sadistischen politischen deutschen Ausbildung eintreteten, die die Banken (insbesondere die Deutsche Bank; A.) schützt, die die Menschen in Europa schädigen. Lasst uns dies stoppen, weil diese deutsche Moral nur beweist, dass die deutsche Gesellschaft seit dem letzten Jahrhundert nichts anderes gelernt hat, als T für B - Panzer für Banken - (bzw. faule Kredite, wie die Mefo-Wechsel für Panzer/Aufrüstung; A.) einzusetzen, im Versuch, Europa (und nicht nur Europa! ; A.) zu erobern. Informationen über die Auswirkungen auf die, die darunter leiden und die Mechanismen, wie dies funktioniert (z.B. über den Verblendungszusammenhang auf der Geldfetischebene (obwohl das Austeritätsprogramm die Ökonomien in Griechenland, Portugal, Spanien, Italien und deren soziale Basis zerstört), sollen benannt werden. Die ökonomischen Begriffe ("haircut") solltest Du nachschlagen (wikipedia etc.). Ich finde aber viel wichtiger, den Geldfetisch zu reflektieren, der die Triebkraft dieses Wahnsinns ist. Darin wird doch tatsächlich das Banken- und Geldsystem quasi als Blutkreislauf angesehen, ohne das die Menschheit nicht überleben kann und gesellschaftliche, entfremdete Prozesse biologistisch definiert. Mit solchen biologistischen Naturmetaphern verschärft sich dann auch der Rassismus / Sozialdarwinismus. I see one of the main problems, that the recent economists and politicians are suffering under money fetishism. 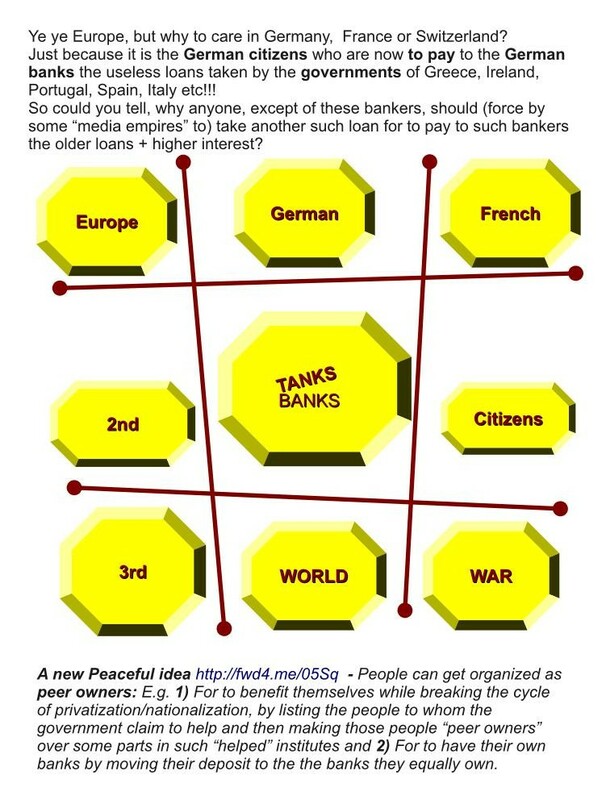 Many of them have the ideology, that the bank- and money system is working as a blood circulation of the economy (BDI boss Hans-Peter Keitel and Andreas Schmitz, President of the Association of German Banks, and I think Merkel and Steinbrück said the same 2008 when they created the rescure shield for banks). I've learned, that biologistic metaphors for social structures/behavior of institutions and individuals are very dangererous. Stop euro pain now because such german morality promoting the "eduction" by destructive punishment can only prove that in the last century the german society In the previous century the german society started two world wars only for to lose both, because of fatal trust in incompetent leaders, inherent ignorance, and homogenic ambitions and perfectionism. learned only replacing T for B or Tanks for Banks in attempt to seizenow, in this century, not by army, but by police, guarding the currency and central bank of europe, but separately from the bonds of germany europe. Sincerely the stopeuropain mailing list. This is a call to Stop the austerity measures orchestrated from, for and by Germany; Measures which are now and always combined with tolerance for killer fascists and increased measures against immigrants and which ultimately together assist in capturing Europe by Germany, as Germany did one century ago - only now, with only one new lesson; Replacing T for B, or Tanks for Banks. Germany, now is the Time to shake you, please wake up , please learn some more lessons from the trouble you have made, only one century ago! Please register each legal daytime info tent here and in this calendar too. 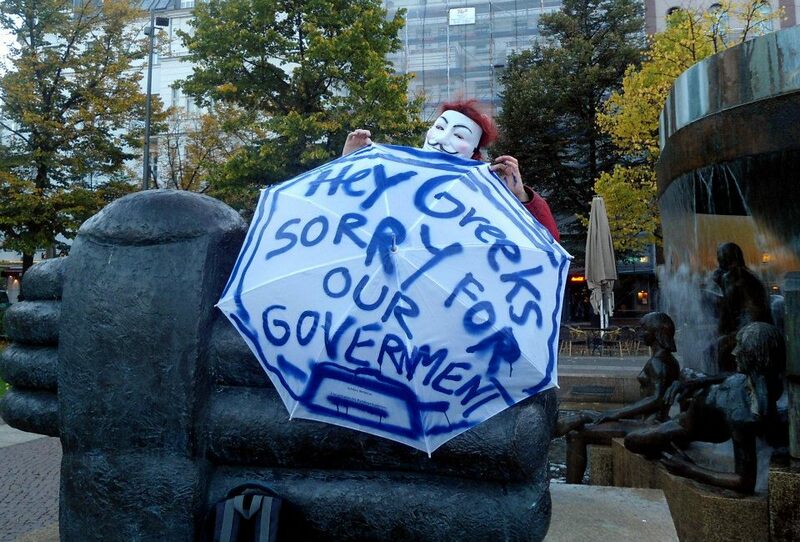 European Students in berlin of which families are living in countries suffering austerity measures. Related Issues: Germany was the 3rd largest arms exporter for the period 2007-2011, where 13% of that export was to Greece, aproved only by elite / "appointed government". I think it is ok to support those who would not pay tax as long as their government would not fully (100%) tax all weapon production profit or eliminate any such profit. We now need you to help in building, informing, learning and just being, with us in our daytime info tent in Heinrichplatz. This is A State of Emergency for us who are against the austerity measures (as even the imf already proved that we get output loss of 1% for every 1% of austerity) and who are against the police aggression against the people in Europ! For us the source for such phenomena must be included - the source who are the politicians allowing such use of police agencies to protect the risk taken by banks, instead of making the banks loss the loan together with the interest they gave for their wrong risk, which was taken while corrupting such or other politicians. Action: opening one or more only day time political info tent in (1st in xberg berlin: Heinrichplatz?) 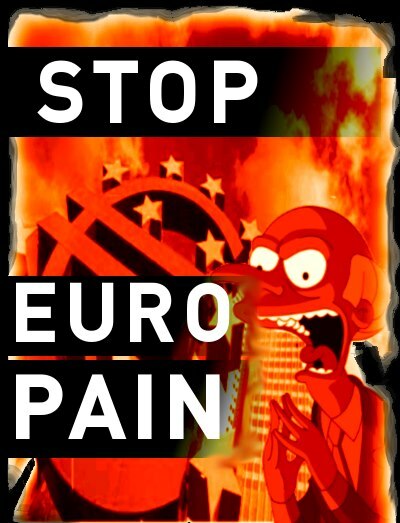 showing the points of pain in europa. Agenda: information from Europe from the point of view of those who suffer in Europe, such as in greece portugal spain greece italy, while pointing out that even the imf concluded that the banks should pay (haircut) for the risks they took, as the austerity measures only destroy the economies and socialites in europe (the imf 10/2012 outlook showing output loss of 1% for every 1% of austerity), such that those (6000) banks could collect in very low price any desired assets in europe, while the German society would now "earn" some new pulse of "educated, well trained and selected" immigration from the poor countries. But and as always, the German society will be defeated by its own successful steps, this time by the people - the people who are agent of human and European values and agent of their origins, the people who would become a Trojan horse in any (German or not) society attacing the people of europ. 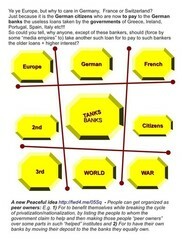 and how much the democracy in Europe is broken.